Lindy hop and balboa workshops, parties, competitions. Lindy hop and solo jazz workshops, parties, and performances with Ramona Staffeld. Longer sessions, special teachers, more challenges. On the weekend. Workshops are a great way to deepen your learning, and to experiment with new ideas, steps, and dance styles. 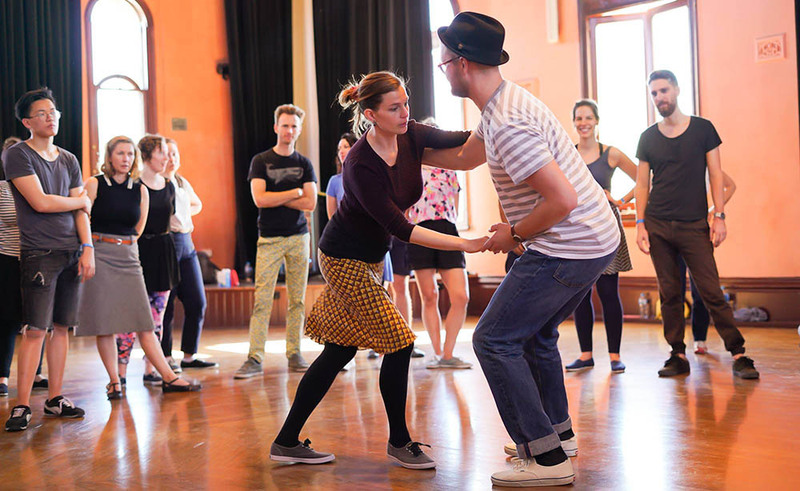 Lindy hop and balboa workshops with a strong focus on jazz history. Live music, parties, and competitions. A whole day of solo jazz workshops, parties, and performances with one of the finest jazz dancers of this generation, Ramona Staffeld. A solid (but smaller) program of workshops and parties with international teachers and the finest live music. 5. Workshop weekends include parties and social dancing - because that's why we do classes and workshops! Our events have featured guest teachers guest teachers Marie N'diaye and Anders Sihlberg (Sweden); Jenny Deurell and Rikard Ekstrand (Sweden); Lennart Westerlund (Sweden); Georgia Brooks and Kieran Yee (Melbourne), Ramona Staffeld (USA/Melbourne); and Ryan Campbell-Birch (UK/Sydney). Check out the websites for individual events.